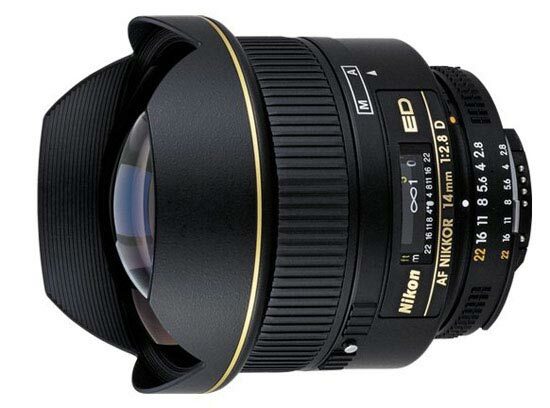 This is a prime lens manufactured by Nikon and the model was launched 2000. The lens has a focal length of 14 mm. Depending on which camera the lens is used, the experienced and perceived focal length will be different. Please visit the list of compatible cameras below, it will provide the equivalent focal length you get on each camera. The lens has a built-in filter holder which means that you at the rear of the lens (towards the camera) can place a filter, but an opportunity to protect the front lens with a filter does not exist. Text from Nikon: "This high-performance, ultra-wide-angle lens is ideal for interiors, dramatic cityscapes or compelling photojournalistic images even in low light.